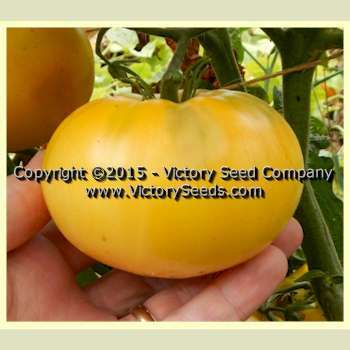 80 days from transplant – first offered to the public in 2012 by Heritage Seed Market. Dwarf Sweet Sue is a potato leaf dwarf variety that produces round to oblate medium sized fruit that ripen to bright yellow with a pink blossom end blush. The flavor is outstanding – well balanced and sweet, and the variety is quite prolific. It originated from a cross made by Patrina Nuske Small between Golden Dwarf Champion and Green Giant, named Sneezy. Dwarf Sweet Sue selected and named by Craig LeHoullier. This is perhaps Craig’s favorite of all of the dwarfs, so he felt it appropriate to name it after his favorite person, his wife Susan.